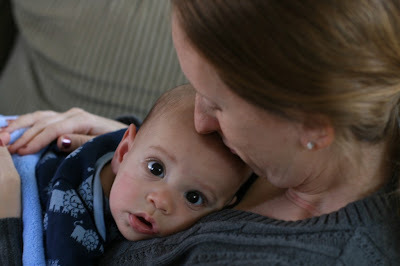 So much changes every month with a new baby, but one thing hasn't changed with Ammon. He loves to cuddle, especially with his mommy. I don't mind one bit. And doesn't he have the biggest sweetest deepest brown eyes you've ever seen? So Ammon hit 5 months on the first of the month(I'm just a little late posting this, oopsie:) Some of the new things he is doing now: making an "oooh" with his little mouth and making that "oooh" sound, grasping objects better, giving big open mouth kisses, grabbing our noses, grabbing our eyeballs or really anything he can get a hold of and scratching them out, making this high pitched screechy sound(he is experimenting with his vocals, its really funny), rolling over constantly & one of my favorites is this "attack!" thing he does. When I get him out of bed or out of the carseat or anywhere and I bring him close to me and hold him, he holds tight onto me and buries his head in my chest and squeals. Its so cute. And tickles too. He takes 3 good naps a day and sleeps 12 hours STRAIGHT at night. Wonderful. He is happy and so mild-mannered. Long gone are the days of him hating his carseat, chairs, bouncers, etc. He loves it all now! He is such a sweetheart. This has been the most fun month so far! He's such a sweetie -- what a gift!! love that little man. wish i could hold him! Handsome for sure. He's definitely like his daddy. Joey was a snuggler too I think he still is if I'm not mistaken. Love that Ammon is loving his car seats and all the seats now. Anxious to see you guys tomorrow have a safe flight. I am so glad that you have that sweet boy. How fast time is going by. I wish that we could keep them young a bit longer. Our Ellie just turned 6 months and we took her to court. What a blessing little ones are.